The free fall of the Indian Rupee (INR) vis-a-vis the USD (American Dollar) has pushed the Indian economy to the edge. Although not entirely unexpected, the extent of the slide has left the people and economists stunned. Everyday, as the INR hits a new all-time low, the things get pushed from bad to the worse, making things rather very very difficult for India's already turbulent economic and political scenario. The RBI's attempts to control the situation and restore people's confidence in the Indian economy seem to be going in vain. Is there a silver lining hidden somewhere? When will things get better? According to Ganesha, there may be no respite from the crisis, at least in the near future. Read on to know more! As per Ganesha's view, the launch date of the new Rupee symbol was not a favourable one. The analysis of the Rupee's falling value has been done using the Solar chart (Surya Kundali) created for 15th July 2010, the date on which the current symbol of the Indian Rupee (INR) was launched. In the aforementioned Solar Chart, the Ascendant Lord is Gemini, and by the natal placement itself Sun and Ketu are in conjunction in the First House (Ascendant). 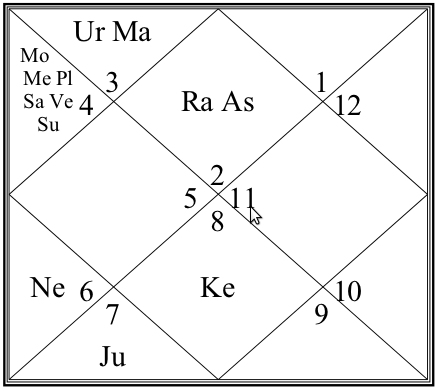 As per this chart, the Lord of the growth of the House of Finance and Economy House is Moon, and the Moon is posited in the 3rd House in Magha Constellation, which is ruled by Ketu. Hence, it may be noted that both the luminaries, Sun and Moon are under a significant influence of Ketu (a negative feature). 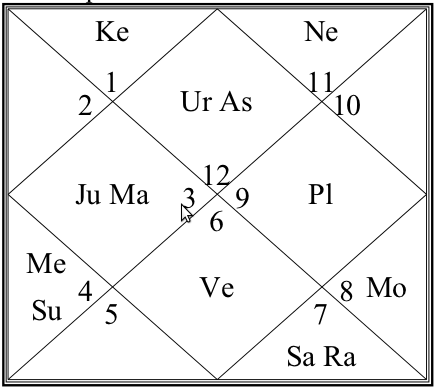 On analysing the Vimshottari Mahadasha picture of this chart, it can be noted that the ongoing Mahadasha is Venus Mahadasha, Venus-Antardasha and Mercury Pratiantardasha. This actually is a positive indication, as FII flow may increase. Two negative planets Saturn and Rahu are transiting through the Speculation House in the Natal Kundali. These two planets will be in this House till 14/07/2014, causing heavy fluctuations in the INR. Till the time Saturn and Rahu are together in the same House, it will be extremely difficult to stabilise the Indian currency. Jupiter is currently transiting through the Ascendant in the INR's chart. This movement shall continue till June 2014, post which Jupiter shall start its movement through the Finance House, which, according to Ganesha, shall bring some positive results. This surmises that the overall future is good, but the road ahead shall not be 'easy', and shall have its fair share of struggles.